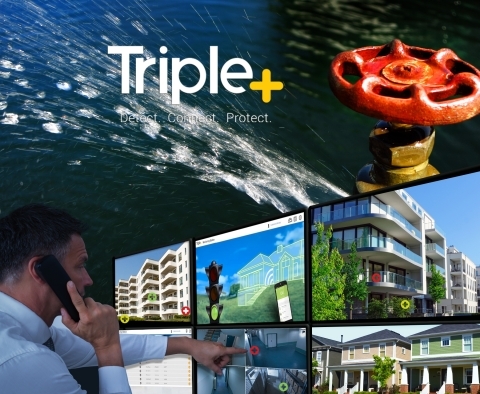 by Brianna Crandall — April 3, 2019 — Triple+, a Toronto-based cutting-edge developer and marketer of state-of-the-art Internet of Things (IoT) solutions for plumbing and heating/ventilation/air-conditioning (HVAC) applications, has introduced a new-generation end-to-end water leak damage prevention system. The new Central Monitoring Station combines multiple devices with a real-time cloud-based capability to monitor water leaks 24/7 across a portfolio. Powered by cloud technology, the Triple+ Central Monitoring Station provides around-the-clock water leak damage prevention management for any building anywhere while managing “unlimited” number of locations from a single dashboard. Property managers, therefore, can view all connected systems at a single glance, and homeowners can manage their property from anywhere in the world through a user-friendly application. Designed for facilities such as offices, condominiums and campuses, where water leaks cause extensive damage if not detected and automatically prevented in time, the system sends real-time push notifications to property owners, facilities managers (FMs), maintenance and/or back-office staff. That enables on-site personnel or their property management companies to take immediate appropriate action to address the water leak. In addition to push notifications, emails and/or text messages can be sent as a backup to assure receipt of the information about an event, giving property owners peace of mind when they are not physically present at the property. Because all Triple+ devices are battery-operated and wireless (including the shutoff unit), installation can proceed quickly, says Triple+. In addition, the company says there are no extra or hidden expenses such as, for example, dedicated WiFi extenders or electrician costs, and no cable trenching is necessary. “That means any disturbance to residents is kept at a minimum, and the number of units installed per day is maximized,” Isakov pointed out. Our channel partners and customers are always our top priority in developing new solutions. By combining early detection capability, automatic damage prevention, 24/7 monitoring, remote access, and cloud technology, Triple+ prevents major plumbing crises and resultant mold while preserving real estate investments, which more than guarantees ROI upfront. For more information about the Triple+ Central Monitoring Station, visit the company’s website. Triple+ products are available in North America and Europe via nationwide distributors. Learn what OSCRE is doing to ensure your CRE data will be compatible with as many systems as possible September 21, 2018 In "Associations and Organizations"